Want To Buy Your Own Super Street Fighter IV Arcade Cabinet? 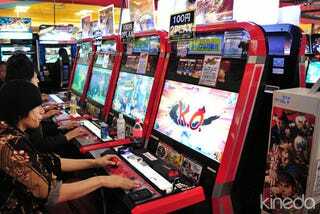 Super Street Fighter IV is officially available in arcades in Japan and...that's it. If you'd like to import your own, then, you'll need to know where to look. Oh, and bring money. While some enterprising (and wealthy) arcades in the West have a cabinet or two on display, there are many who simply live too far away from one to play regularly. Or who are rich and would just like to skip the lines. If that sounds like you, Shoryuken reports that you can get your very own pair of SSFIV cabinets for a pinch under $17,000. That price gets you the two official Taito cabinets (so you can engage in some linked play) with Street Fighter IV pre-installed, along with a 90-day warranty. Seventeen grand is a little rich for our blood, but if any of you know any rap stars or children of oil magnates, best of luck to you.